As the Guggenheim’s No Country exhibition arrives in South-East Asia, Gwen Pew talks to its Singaporean curator June Yap. At the same time, many people do tend to have specific preconceptions about Asia, which is something Yap was very conscious of, particularly when considering some of her New York audiences who would first see the show. ‘I didn’t want people to go into the show and immediately say, “Oh that’s Asia”,’ she says, explaining why she went to great pains to ensure that the selected works did not confirm to any stereotypes or presumptions. The exhibition was put together after three months of country-hopping and speaking with artists Yap had previously worked with as well as ones who she’s so far only admired from a distance. The final tally comes to 40 works by 27 artists, comprising a variety of media, from paintings and sculptures to videos and photographs that were all created between 1994 and 2012. After first opening at the New York Guggenheim in 2012 and showing in Hong Kong’s The Asia Society last October, 19 pieces by 16 artists from the show will be arriving in Singapore this month. Of course, with the shift in the works’ context from a representation of Asia in the West to them being shown in their native region – which Yap views as a home-coming of sorts – comes a change in audiences as well. Although she acknowledges that many people in Singapore have yet to make gallery-going a regular activity, Yap has faith that the collection of works in No Country will be able to pique the public’s interest. 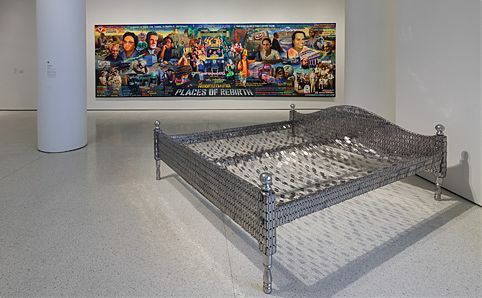 ‘Love Bed’ by Indian artist Tayeba Begum Lipi, a double bed made out of razorblades, which is a brilliantly eye-catching piece that hints at the idea of domestic violence. Vietnamese- American Tuan Andrew Nguyen’s ‘Enemy’s Enemy: Monument to a Monument’ – a baseball bat beautifully carved with a monument to Thich Quanc Duc, a monk who immolated himself in 1963 in protest against the Diem regime – encompasses both the artist’s dual identity and a wonderful juxtaposition between violence and serenity. It’s been two years since Yap first selected the works, but she’s clearly still infatuated with them. ‘I’m still amazed when I look at them, and I still want to touch some of those pieces!’ she laughs. ‘Revisiting them is like re-reading a good book. They’re familiar, and yet I’m still finding new things about them.’ At the time of print, she is working with the team at the Centre for Contemporary Art (CCA) at Gillman Barracks to install the show, but also to put together a programme of guided tours, artists’ talks and screenings for the public to learn more about the works. ‘I don’t think one should judge how successful a country’s art scene is by the number of people going to the museums, but rather by asking whether or not they are producing exciting works that make people want to come in and see and find out about them,’ says Yap. ‘I believe that it’s about finding that personal experience with the art, and to encourage them to continue and be unafraid [to question their meanings].’ The rest, she insists, will follow.